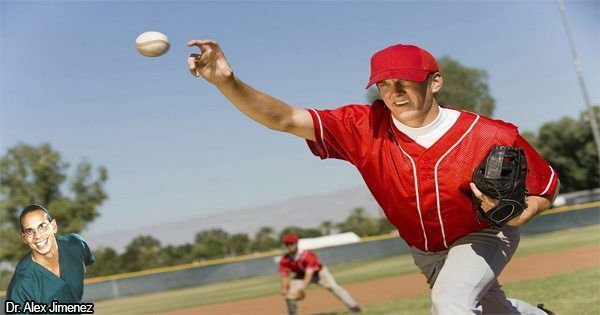 Throwing sports, such as baseball, largely involve constant overhand throws which place immense stress on the elbow. The repetitive high stress baseball pitchers or other throwing athletes undergo many times may cause serious overuse injury. Overuse injuries, unlike an injury resulting from trauma, develops progressively over time due to the frequent athletic movements practiced during the sport, therefore the body isn’t allowed the necessary time needed to rest and repair itself. Injuries from throwing sports mainly occur at the inside of the elbow. During a throw, an athlete applies considerable force over the inner elbow to throw repeatedly at great speeds, concentrating stress on the elbow. The ulnar collateral ligament, or UCL, is the most commonly injured ligament in throwing athletes. Located on the inside of the elbow, the ulnar collateral ligament runs from the inner side of the humerus to the inner side of the ulna. The ligament withstands extreme stress in order to stabilize the elbow during overhand throwing. UCL injuries can range from minor irritation to a complete tear of the ligament. 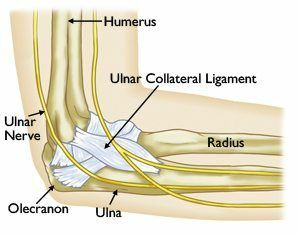 The most commonly known symptom of an ulnar collateral ligament injury is direct pain over the location of the ligament on the inner side of the elbow. Other well-known symptoms include pain experienced while throwing, a “popping” sensation when the pain begins, inflammation on the elbow, numbness and/or a tingling sensation in the hand and fingers, and a limited ability to throw and a decrease in the velocity of the affected athlete’s pitch. In many cases, the pain and symptoms of an ulnar collateral ligament injury will settle when the athlete stops throwing. This type of injury is uncommon to occur in non-throwers. In baseball, the risk of developing a UCL injury depends on each individual athlete, mainly focusing on the amount of time spent practicing throws, to the velocity of a throw, and even depending on how tall and heavy the athlete is. Even so, it’s always important to receive a careful evaluation of any suspected injury because not every elbow pain in a throwing athlete can be a UCL injury.